It’s often difficult to choose which VPN to use. After all, there are so many different services, all claiming to be the best, fastest, or most secure. Recently, we’ve been pitting top VPNs against each other to see which is better for the average user. In this post, it’s ExpressVPN vs PureVPN; take a look below for our comprehensive, side-by-side comparison. PureVPN is the less expensive of these two services, both for month-to-month subscribers and those who commit for longer periods of time. However, it doesn’t offer a six-month subscription plan, so you’ll have to be prepared to pay monthly or for at least a year upfront. ExpressVPN is known for its generous 30-day money-back guarantee which it honors with no questions asked. PureVPN has recently increased its guarantee from seven days to 31 days across all plans, so both services are now almost equal in this regard. You will have to pay upfront, but this means you can effectively test these VPNs for a month, completely free. 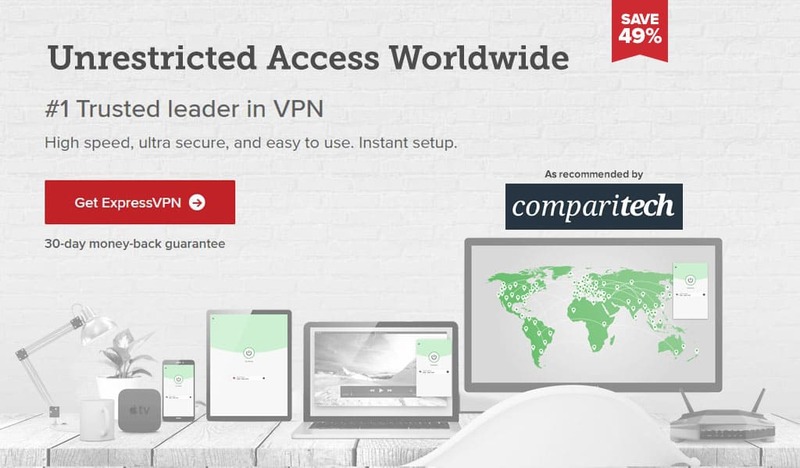 Best Deal for ExpressVPN: Cut the cost by 49% with a one-year subscription. Best Deal for PureVPN: Save 68% on a two year deal. ExpressVPN is known for its exceptional multi-platform support. Not only does it offer apps for Amazon Fire devices and Linux, it even has custom firmware that makes installing it on routers as easy as possible. PureVPN, meanwhile, supports the most popular operating systems. It previously offered an iOS app, but this is currently unavailable, and there’s no estimated date for its return. PureVPN does, however, have an official Kodi app, which isn’t something you see often. 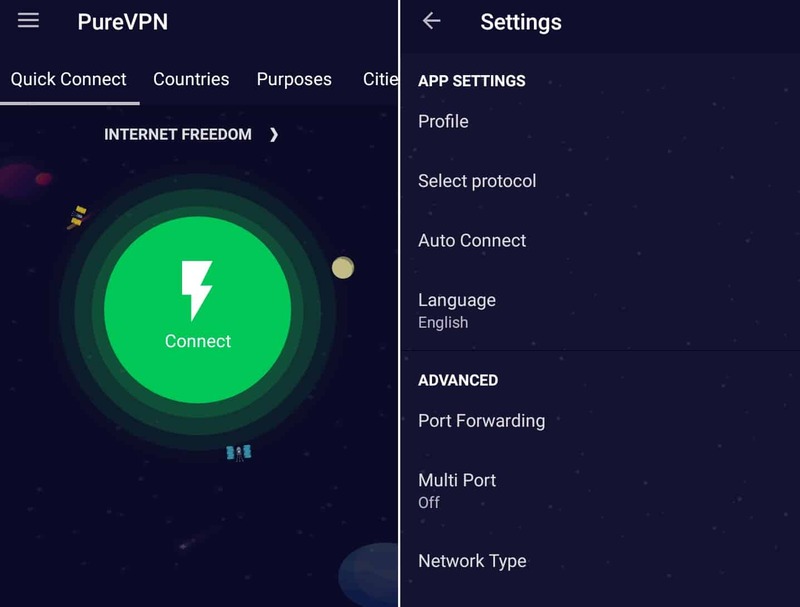 While PureVPN has split-tunneling (the ability to choose which apps are protected by the VPN), ad-blocking and malware-scanning features, it can’t compete with all of the advanced functionality ExpressVPN provides. There’s a smart DNS app, for instance, that allows you to unblock geo-restricted services without encrypting your traffic. Named MediaStreamer, it lets you increase your speeds at the cost of security. 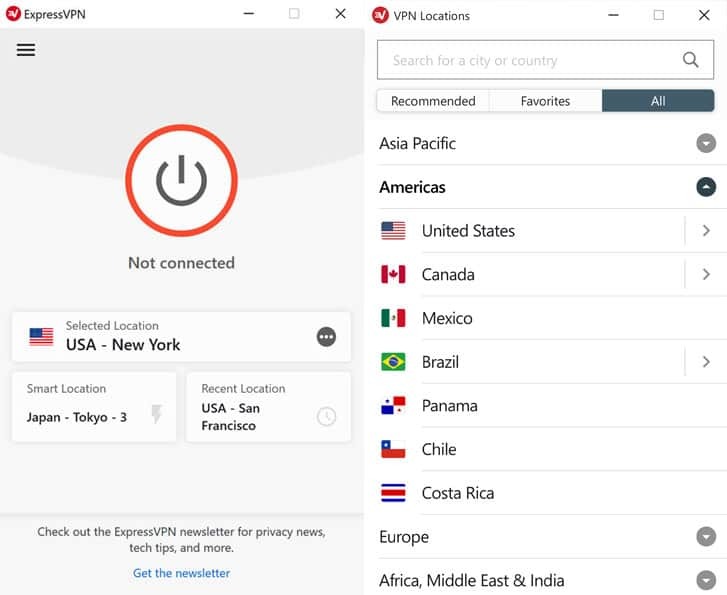 ExpressVPN also offers split-tunneling (in desktop apps) and browser extensions that let you control the app directly, as well as automatically change your browser’s geolocation settings to match your chosen location. 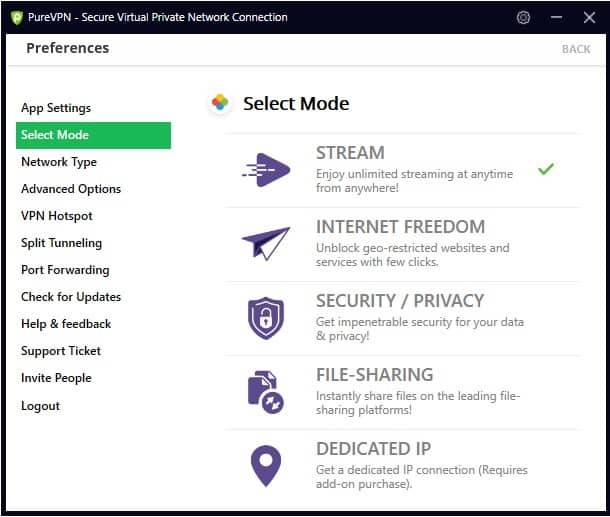 However, PureVPN does permit more simultaneous connections than ExpressVPN: five and three, respectively. This means that ExpressVPN users could find themselves leaving one device unprotected just to use the service on another. That said, routers automatically protect every connected device, and thanks to its custom firmware, ExpressVPN can be installed more easily on routers than PureVPN can. Both ExpressVPN and PureVPN are able to unblock a wide selection of popular streaming services. However, PureVPN struggles to bypass geo-restrictions on the more stubborn platforms like the BBC iPlayer and ABC. This isn’t unusual; low-cost VPNs often have difficulty with these services. ExpressVPN however, can unblock them without any difficulty. Additionally, it allows access to a wider range of Netflix libraries, making it the better choice for streaming abroad. Although the PureVPN website has a page stating how effective it is in China, the service doesn’t actually work there. Customer support claims that this is due to recent upgrades to China’s Great Firewall. There does not appear to be a workaround at the time of writing. PureVPN’s website is currently blocked in China, so there’s no way to register or download the service when in China. ExpressVPN, on the other hand, works perfectly. While the service’s main website is blocked, the customer service team can point you to a working mirror site where you can sign up and get the software. Read more here on using ExpressVPN in China. ExpressVPN maintains a consistent user interface across its desktop and mobile apps. The main screen is uncluttered, with a connect button in the center. The country-selection and smart-locations options are placed at thumb-level on mobile devices, too, making it quick and easy to get connected. The mobile app has fewer configuration options than its desktop counterpart, with kill switch and protocol selection features noticeably absent. PureVPN looks a bit different on mobile and desktop. Its desktop interface is a little confusing: you have to enter a menu to change from one mode to another. The home screen itself is decent, though, allowing users to search for a specific country or connect to the best server with a single tap. The mobile app features a large connect button, and a sliding panel you can use to choose a server from a particular country or city. It’s possible to view servers optimized for specific tasks like gaming or streaming. However, some servers claim to unblock BBC iPlayer and let you browse freely in China, neither of which work. 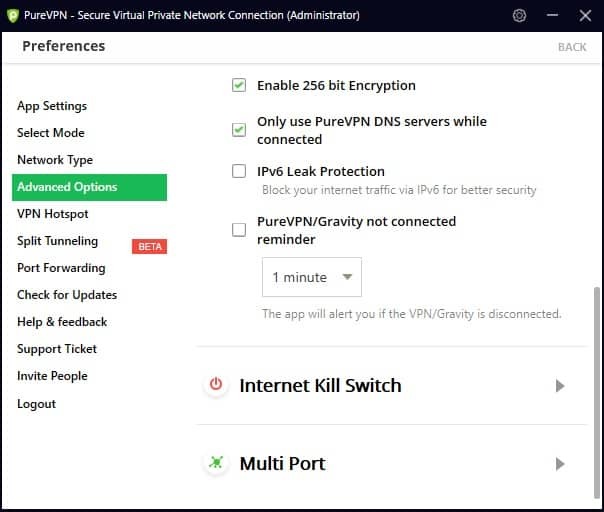 PureVPN brings most of its functionality to the mobile app, with options to enable the kill switch, change protocol, use split tunneling, or secure your wifi connection. ExpressVPN has servers in over 90 different countries, which is already more than many of its rivals. However, PureVPN, in spite of its low price, offers access to 141 countries. Admittedly, many of these are low-traffic regions like St Lucia and Aruba, but more choice is never a bad thing. It’s worth noting that 82 of PureVPN’s locations use virtual servers instead of having servers physically located in that country. Virtual servers are often used to provide access to locations where the internet infrastructure is poor, or where maintaining a physical server would be too expensive, difficult, or dangerous. ExpressVPN also uses virtual servers, albeit only in 33 locations. Each of these VPNs allows you to choose which city you’d like a server in. City availability varies wildly, however; outside of the US, UK, and Germany, PureVPN usually only offers one or two locations per country. ExpressVPN, on the other hand, tries to provide at least a few options for most high-traffic areas. This makes ExpressVPN the better choice for unblocking local TV streams or blacked-out sporting events. 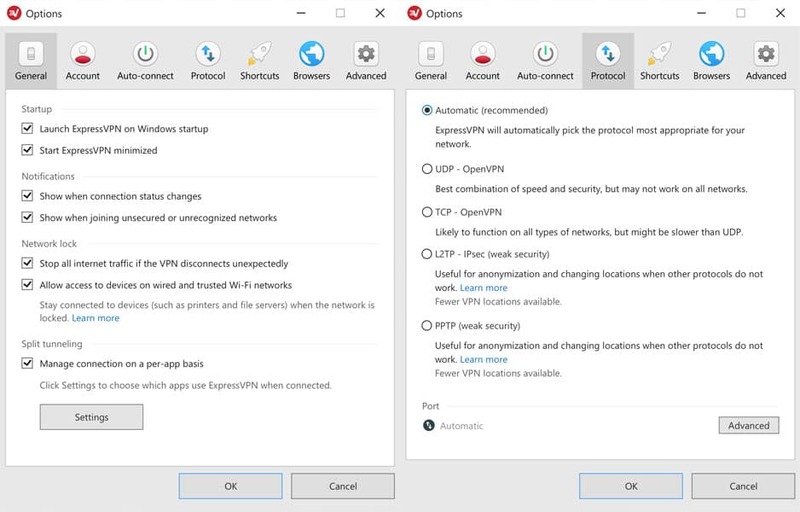 Both of these VPNs support the OpenVPN, L2TP, and PPTP protocols. That said, PureVPN also includes the option to use SSTP or IKEv2 if you’d prefer. The value of SSTP is questionable, given it’s fairly old, mostly used on Windows devices, and OpenVPN is equally secure. IKEv2, however, is a useful addition, particularly when used on mobile devices, as it’s very fast and enables you to automatically reconnect after losing your connection. Although PureVPN and ExpressVPN both use 256-bit AES encryption, ExpressVPN is theoretically more secure as its RSA keys are twice as long, and thus, harder to crack. Additionally, ExpressVPN uses a process called cipher block chaining which makes every piece of your traffic reliant on the one before. This means any connection interruption or intrusion is immediately noticeable. On the other hand, PureVPN includes a kill switch in its desktop and mobile apps. ExpressVPN only offers this functionality on Windows, Mac, and Linux. Each service uses private DNS servers, which removes third-party hosts from the equation and ensures no other entity ever has access to your traffic. ExpressVPN is based in the British Virgin Islands where there is no data retention legislation. This provider does keep some metadata logs (connection dates, data transferral volume, and which server you used). However, it doesn’t log your source IP address, which sites you visit, or connection times. This service allows you to pay in Bitcoin for added anonymity. PureVPN operates out of Hong Kong. Despite having its own legal framework, Hong Kong is still technically part of China, a country with some of the most comprehensive internet monitoring in the world. That said, as the service allows you to sign up anonymously (using a disposable email address and paying in cryptocurrency). Further, it records no personally identifiable information so there shouldn’t be a risk of your activities being traced back to you. Each of these services works slightly differently. For instance, with ExpressVPN’s shared address allocation, everyone who uses a particular server at a particular time is given the same IP address. This makes it harder to tell one user’s activity from another. No activity logs exist, so it’s simply a second layer of protection. PureVPN uses a dedicated system where each user has their own static IP address (although shared servers are also available). This means you’re much easier to track from one site to another, but it reduces the risk of triggering automatic fraud prevention systems, for example, when accessing your online banking service. Neither VPN offers specialized anti-DDoS servers. That said, you’re protected to some degree simply by using a VPN. Instead of overwhelming your device with requests, an attacker would be sending them to your VPN’s server. These can then spread the load across the rest of the network, mitigating the attack’s effect. Unless you’re being targeted by a massive botnet, the worst that can happen is the VPN server will go down for a few seconds while it switches to a new IP address. PureVPN and ExpressVPN both offer support via email, a ticket system, or live chat (note that PureVPN requires you to have an account before you can access the live chat). We tested both live chat services and found that responses were prompt, usually in a few seconds. Both services offer video tutorials in their respective knowledge bases, but ExpressVPN also posts abridged versions on its YouTube page, while PureVPN’s are mostly used for promotion. To test each service’s ticket response time, we sent three questions to each provider via email. Of these, two were the kind of query they receive every day and one was slightly more vague. It’s worth noting that as live chat is the primary means of support, the email response time is almost guaranteed to be significantly longer and does not reflect how long it would take you to get help in an urgent situation. These VPNs actually replied pretty quickly to email enquiries compared to some other services we’ve tested. Their answers were usually very brief, a few lines at most, but to their credit, the question was always addressed. However, over live chat, PureVPN’s support team were occasionally evasive and required continuous prodding to get more than a copied-and-pasted response. While these are both high-quality services, ExpressVPN is comfortably the better of the two for the average user. ExpressVPN makes it as easy as possible to get connected. It doesn’t matter whether you’re in China, using a Linux system, or trying to install the service on a router: this service does all it can to simplify things every step of the way. Even if you run into difficulty, you’ll find that the knowledge base explains how to fix the most common issues, with support available instantly for more complicated problems.